If you ask ten people to define DevOps, you’ll likely get a dozen different answers. Somehow it’s 2018 and we still can’t agree on what DevOps is, only what it looks like. The truth is that successful DevOps implementations require hard work over long periods of time. DevOps at Threat Stack is a survival mechanism – it’s how we turn ideas into reality quickly and safely. Learn how we design our telemetry system to support useful, actionable metrics and the steps we take to level up our engineers, giving them the necessary accountability to truly own the applications they build. 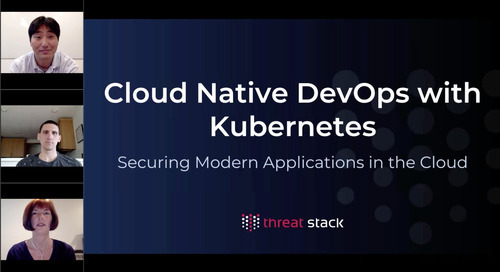 Threat Stack's Todd Morenau sits down with the authors of the new O’Reilly Media book “Cloud Native DevOps with Kubernetes: Building Deploying and Scaling Modern applications in the cloud". See first-hand how hackers bypass security controls and execute a crypto mining attack. Then watch how a security engineer is able to quickly identify the attack before it becomes a breach. Watch this video for practical advice to help you build and mature a cloud secops program for your organization. Do you have the chops needed to pass Type 2 SOC 2 with zero exceptions? Watch this video for advice from our Head of Ops and Sr. Infrastructure Security Engineer who recently went through the process. T-72 Hours to Report a Breach: Are you GDPR Ready? GDPR deadlines are fast approaching and many US companies are behind the curve. Watch this video to learn how you can take a practical, manageable, and cost-effective approach to dealing with GDPR. Watch this video to learn how to evaluate and measure security in the cloud, and how you can work with service providers to improve it. Watch this on-demand webinar to learn from Threat Stack's CSO, Sam Bisbee, about the top security concerns of 2018 and how you can create an actionable plan to address them. Check out this video to learn how Allocadia's CISO utilizes a lean security strategy by automating processes and selecting the right tools for his security stack. Watch this video to learn more about the importance of securing non-production environments and how to get started today. Watch this video to learn more about security and compliance in the cloud and how to get visibility and intrusion detection in your cloud environment.